Dental avulsion injuries are mostly seen in young patients in the anterior region of the maxilla. The main physical characteristics outlined as significant risk factors for dentoalveolar trauma are poor lip coverage and an increased overjet, which are both present in Class II division 1 malocclusion. If teeth are reimplanted there is a serious risk for permanent ankylosis and internal and/or external root resorption. Ankylosis of the central incisors is a challenge for any orthodontist. 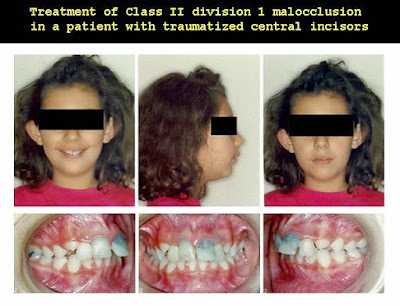 In cases of Class II division 1 malocclusion with traumatized and ankylosed central incisors, extraction and space closure might be a solution to treat the increased overjet. However, this treatment option requires the lateral incisors to assume the role of central incisors and the canines to assume the role of the lateral incisors. The first premolars take the place of the canines, doing the excursive movements with restorative treatment for camouflage the positional changes. Therefore, the objective of this article was to demonstrate this procedure in a young patient.